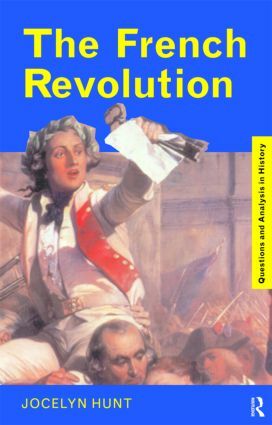 In the French Revolution, Jocelyn Hunt examines the major issues and background to the revolution, including its causes, and disputes as to when it ended. The author also surveys the views of historians on this period and looks at wider questions such as the nature of revolution. Beginning with the pre-revolution economic and political situation, and covering through to the fall of Robespierre and the rise of Bonaparte, this book provides both challenging analysis and a concise introduction. Questions and Analysis in History contain the key elements essential to the study of history, whilst also offering a guide to best practice in essay writing and history skills. Each chapter of every book is organized around the key questions which historians debate, and hence, examiners look for. In addition, these short texts include a systematic examination of a variety of primary sources through questions and worked answers. * promotion of discussion in class. The series is regarded as the set of books that will push the student to an A grade. The books are both stretching and stimulating, and students have founf them invaluable during their revision for the final exams.